American Airlines has just sent out likely targeted offers for instant Gold or Platinum AAdvantage status and fast track offer for keeping the status all the way to February, 2015. Note that these offers will likely only work for those that received the mailer, but you never know. Even if you register and receive an email confirmation, it doesn’t mean that AA will honor this promotion for your account. Flights taken on American Airlines, American Eagle, American Connection, British Airways, Finnair, Iberia, Japan Airlines, and Qantas (on eligible fares) count towards competing these challenges. You can read more about American Airlines status match program for Gold, Platinum and Executive Platinum status here. If the registration is successful, you will also receive 20 500-miler electronic upgrade coupons that you can use to upgrade domestic American flights from economy to business class. You need 9,000 EQP’s (Elite Qualifying Points) or EQM’s (Elite Qualifying Miles) between October 1 and December 31, 2013, to keep the status until February 2015. Note that you only earn 0.5 EQP’s on lowest discount fares per mile flown but 1.5 on full economy, business and first class fares. You earn full EQM on all paid American Airlines fares. The AA web page for this offer is here. For Gold members, American Airlines will deposit 10 500-miler electronic upgrade coupons. You need 4,500 EQP’s or EQM’s between October 1 and December 31, 2013, to successfully complete the challenge and keep the status until February, 2015. The AA web page for this offer is here and the code to register is HVDGR. It is truly amazing how many targeted offers for instant AAdvantage status American Airlines has had this year. The offer that the airline had last month was open for all and up to Executive Platinum status. This time these offers are targeted and very unlikely to work for those that haven’t received the mailer. This offer was first covered on Slickdeals website here. This is an exclusive offer only for members who received a letter directly from American Airlines. You must register at aa.com/platinumoffer by 11:59 p.m. CT on September 27, 2013, and prior to travel in order for your elite-qualifying miles or points to count toward this promotion. AAdvantage Platinum status received through this offer is valid through December 31, 2013. Your AAdvantage Platinum status will be valid within 10 business days of registering for this promotion. Your new membership credentials will be mailed to you within four to six weeks after registration. You must re-qualify for AAdvantage elite status membership annually. Learn more about standard qualification levels. AAdvantage Platinum status received through this offer is valid through February 28, 2015. Upon reaching the required elite-qualifying miles or points threshold, your AAdvantage Platinum status benefits will be extended immediately. Your new membership credentials will be mailed to you within four to six weeks after qualification. Qualification for the extension of your elite status membership applies to base miles or points earned on eligible, purchased, published fare tickets on select airlines between October 1, 2013, and December 31, 2013. Select each airline name to learn more about qualifying fares for that carrier: American Airlines, American Eagle, American Connection, British Airways, Finnair, Iberia, Japan Airlines, and Qantas. Bonus miles do not count toward elite status qualification. You must re-qualify for AAdvantage elite status membership annually. Learn more about standard qualification levels. Your 500-mile upgrades will be deposited into your AAdvantage account within 10 business days of registering for this promotion. Standard 500-mile upgrade Terms and Conditions apply. This is an exclusive offer only for members who received a letter directly from American Airlines. You must register at aa.com/goldoffer by 11:59 p.m. CT on September 27, 2013, and prior to travel in order for your elite-qualifying miles or points to count toward this promotion. 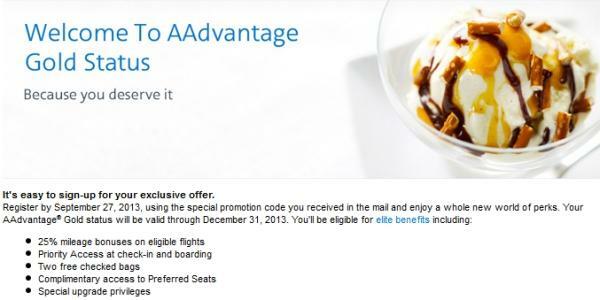 AAdvantage Gold status received through this offer is valid through December 31, 2013. Your AAdvantage Gold status will be valid within 10 business days of registering for this promotion. Your new membership credentials will be mailed to you within four to six weeks after registration. You must re-qualify for AAdvantage elite status membership annually. Learn more about standard qualification levels. 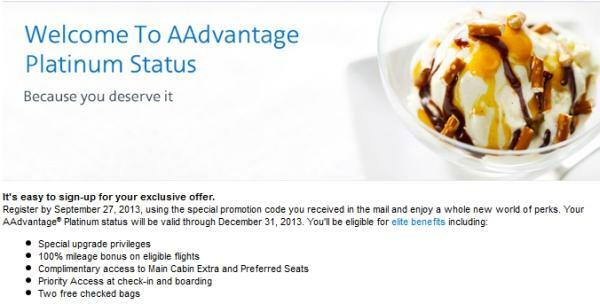 AAdvantage Gold status received through this offer is valid through February 28, 2015. Upon reaching the required elite-qualifying miles or points threshold, your AAdvantage elite status benefits will be extended immediately. Your new membership credentials will be mailed to you within four to six weeks after qualification. Qualification for the extension of your elite status membership applies to base miles or points earned on eligible, purchased, published fare tickets on select airlines between October 1, 2013, and December 31, 2013. Select each airline name to learn more about qualifying fares for that carrier: American Airlines, American Eagle, American Connection, British Airways, Finnair, Iberia, Japan Airlines, and Qantas. Bonus miles do not count toward elite status qualification. You must re-qualify for AAdvantage elite status membership annually. Learn more about standard qualification levels.